Buy-n-Shoot has reviewed the Samsung WB500 digital compact camera that features a 10x optical zoom lens and 10 megapixel image sensor. Buy-n-Shoot ends up giving the Samsung WB500 a “Gold Medal” review as the reviewer seem to like the camera quite a bit. It might not be the slimmest and most beautiful camera on the marked, but it is packed with good technology. The Samsung contains a very good 10x zoom lens that should suit most needs. Of course no camera is perfect and as most cameras in this price class it suffers from some noise at higher ISO levels. 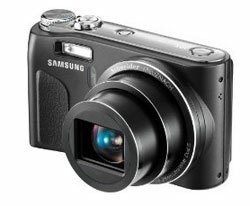 Read the full review of the Samsung WB500 camera here.